Violinist Anne Akiko Meyers will join the Richmond Symphony in March to perform a brand new violin concerto by Mason Bates. Born in 1977, Bates, who happens to be a Richmond native, is currently composer in residence with the Chicago Symphony. 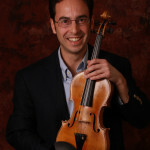 The Violin Concerto, written for Meyers, was recently premiered by the Pittsburgh Symphony. Learn more about the concerto here and here. One of the most interesting aspects of Bates’s music is the way he uses the new, electronic sounds of the twenty-first century. Composers have always been inspired by the sounds around them. In the Classical period inspiration came from the sounds of nature…bird songs and brooks. With the industrial revolution the orchestra got louder and more dissonant. In Bates’s music we hear the influence of Techno, Ambient, film scores, John Adams and more, all mixed together in a shimmering sonic stew. This is the musical vocabulary we hear around us every day. Now that you’ve heard The B-Sides, here is Mason Bates’s description of the piece. He has some interesting additional thoughts in this interview. Bates talks about the use of electronic sounds in the orchestra here. Mason Bates joins a long line of composers who have been inspired by electronic sounds. Karlheinz Stockhausen influenced the development of electronic music in the twentieth century. Here is his “Studie II” (Elektronische Musik) (1954). Edgar Varese’s Poème électronique (1958) was written for the Philips Pavilion at the Brussels World’s Fair. American composer George Crumb’s string quartet, Black Angels (1970), uses a variety of new, amplified sounds as well as percussive instrument tapping and bow scraping. What experience do you have as you listen to this new music? How do these sounds reflect our modern world? What impact will electronic sounds and pop influences have in the future? In an age of computers and the prospect of increasing artificial intelligence, are electronic sounds somehow less “human” or are they a natural extension of the orchestra, as Mason Bates suggests? If you feel inspired, share your thoughts in the thread below.